"Is he real?" Kyle asked. Mom and Dad had gone out to pick up a surprise one day in October of 1996, and they came home with Clyde. He was tiny—not only was he a beagle, a small breed, but he was the runt of the litter. They had gone out to a farm in the Illinois countryside where beagles were bred. Mom said that when they arrived, the farm owner opened the barn door, and beagle puppies came flopping and running and tumbling out like 101 Dalmatians. They wagged their tails and wiggled their bums and jumped around Mom and Dad's feet. For some reason, Mom decided to peek into the barn. Inside, there was a small pup curled up under the heat lamp. "What's wrong with that one?" my mom asked the farm owner. "Nothing," she said. "He just wants to stay warm." Mom went in and picked him up. He snuggled into her neck. They brought him home. When they got back, they had Kyle and I—just 8 and 13 years old, respectively—sit down on the couch in the family room and close our eyes. Mom came walking in with the puppy still nuzzled into her neck. "Is he real?" Kyle asked. We found out soon enough that despite his marked love of creature comforts, Clyde definitely was real. He chewed the undersides of the recliners in the family room. He nipped. He was the most stubborn animal we'd ever met. But eventually he settled down, although he never ever gave up that stubborn streak. We named him Clyde because at that time we had planned on getting a girl beagle sometime in the future and naming her Bonnie. Of course, Clyde turned out to be...how shall I say it?...a top dog kind of dog. He once broke free of his leash and charged an enormous bulldog, and was unfazed when the bulldog seemed to chuckle at the furry sausage with legs running at him. Clyde was a short-legged beagle, but being the runt, his legs were especially short. "He's not fat," I told my friends repeatedly, "he just has short legs!" Of course the time he refused to continue walking in the heat of the summer, and forced me to carry his ungainly 40-pound self back to our house while people in passing cars pointed and laughed at the spectacle, I kept the short-leg excuse to myself. I have to say, though, it was quite rude when once a person driving past our backyard slowed, rolled down their window, and shouted with great mirth: "That's the fattest dog I've ever seen!" He was often confused for a basset hound, he was so squat and portly. Before he, ah, rounded out, he was an energetic and particular puppy. He loved people food, but only when it was prepared to his liking. For instance, he wouldn't eat plain graham crackers, but he'd scarf them down when Nanny gave him share of her buttered graham crackers with her morning tea. When he was still just a pup, my friends Branson and Neale stopped by the house one evening. Dad being Dad and Kyle being Kyle, they only welcomed the boys into the foyer, then stood there the entire time, which amounted to about three minutes once the guys realized that the foyer was as far into the house as they were going to get. Kyle leaned casually on the stairs in his race car pajamas while Dad held Clyde, who was squirming and wiggling to get down and harass them (as though Dad and Kyle weren't harassing them enough). I was quite pleased, however, when after they left Dad discovered that Clyde had peed on him in his excitement. "Well that's what you get for it," Mom had said. Mom and Dad brought Clyde home just a couple of months after we moved to Chicago. Although it wasn't an unpleasant time for me, it was a transitional time that certainly had its difficulties: I was a California kid suddenly in the Midwest; I was starting 8th grade at a new school where everybody knew each other and nobody knew me; I had to trudge home almost a mile in snow and subzero temperatures after being used to winters where the temperatures rarely dropped below the 50s. Clyde was warm and cute and funny—when he went out to use the bathroom, he'd leap, then disappear into the snow, then leap, and disappear, ad infinitum—and he made that transition easier for all of us, I think. He was a constant presence in our lives: He always weaseled his way into family pictures; on Christmas mornings, he'd plant himself directly in the pile of presents; if there was any people-type item on the floor—a stack of papers, a book or magazine, etc.—he'd always go stand on it. Whenever we got down to his level, he'd come over and sniff, often putting his cool wet nose on our eyelids for some reason. And he was a cuddly dog, too. On one cold winter morning, Mom woke up to discover that Clyde had wedged himself under her pillow during the night. For the past couple of years, Nanny would take her dinner in bed, and Clyde would always pad up the stairs, one at a time and from side to side in his own particular way, to see if she had any scraps for him. She often did. As I said, he loved his comforts. ... and fall over "dead" when Dad yelled "Bang!" We praised him so much for this trick, that he became a one-trick kind of dog. Whenever he wanted something, he'd "Freeze!" in hopes that we'd give it to him. As he got older, the fur around his eyes getting whiter, he spent his days sleeping at my mom's feet while she worked. He commandeered several knitted blankets as his own. He frequently made beds for himself in piles of laundry—clean and dirty. His eyes became slightly milky, and we knew that his vision wasn't great. For the past few months, we could tell that his hearing was going as well. In his later years he had developed some pretty serious skin conditions that started with allergies and led to infections. In the past year, though, his veterinarian had found a winning combination of meds to get the situation under control. But something else appeared: lumps. As time passed, he developed more and more lumps. The vet speculated that it was lymphoma. My parents didn't want to put him through a biopsy and the testing, and the vet confessed that he wouldn't be comfortable putting him under anesthesia anyway. They decided to watch him, make sure he was comfortable. In the past couple of weeks, his bark changed. He had a signature hound's howl that he'd bellow at the bunnies and squirrels and chipmunks that skittered around the yard, but the lumps in his throat made that howl raspy and almost hollow sounding. And then he started sleeping more and more. Mom and Dad said that he'd look up at them and close his eyes, sleeping even as he sat. In the past two days, he became unable to stand. He didn't want to eat. 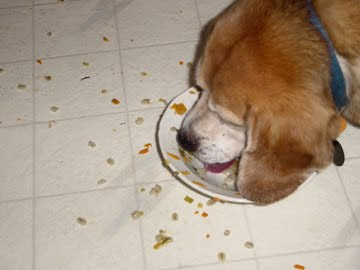 When he would eat, usually small scraps of meat that his medicine was wrapped in, it would make him sick. The vet did blood tests, and almost everything came back bad. He had an enlarged heart, liver, and spleen. Yesterday, they decided it was time. Mom and Kyle took him to the vet, and let him go. I found out on my way home from work. Clyde is who this blog is named for. In fact, my very first post was about him. He was a fierce little thing—or at least fancied himself as such—and so when several years back I was asked to join a fantasy football league, I could think of no more appropriate name than "The Fierce Beagles." After getting married (incidentally, Clyde stood on my wedding dress as I was getting ready that morning), when Noah and I decided to get a dog, we looked to the Triangle Beagle Rescue to find one. Of course Cody didn't come as advertised: he's more of a miniature horse than a beagle, but he does have ears just like Clyde's, and a howl as well. Clyde was our Chicago dog. He came to us just after we arrived, and he left us just before the last of us departed. He was real, and he was a good boy, a great companion. He was our Chicago dog. And we'll miss him terribly. I'm so sorry for your loss. He sounds like a wonderful dog and I'll have to go back and read your first post about him. We lost our golden retriever two years ago and miss him terribly. Fortunately, the two crazy beagles we have now help ease the pain a little. Beagles rock! Oh sweetheart, I am so very, very sorry. I never met Clyde, of course, but I'm shedding tears for him - and you - right now. He sounds like a real character and part of the family; it's terrible when they go. Sympathy (real) and tea (virtual) from me. I just knew you would dedicate today's blog to Cylde. I can't even speak right now. Thank you Erin. We loved him so much. I'm crying for you and Clyde and your family too. Losing a pet is ... how do you find words for that? I'm so sorry for your loss. He sounds like a lovely dog, and I can tell your family loved him a lot. Your mum's comment pushed me over the edge and made my eyes well up. Isn't funny how those four legged fur-balls can capture our hearts? Loyal and innocent. Well, not always innocent, but certainly loyal. Sorry for the loss, but happy for the memories. I am sorry for your loss, but what a great post and tribute to your friend. It has been almost 3 years since I lost my buddy and wanna-be police dog "Sara" the springer spaniel, and I still think of her often. Aw, poor Clyde. What a good boy. I feel like--for people who own pets--our lives are defined in eras when our pets lived and enriched our lives. My childhood was the "Three Beagles" era, my teens the "Casey" era, and my adulthood the "Pipp" era. I'm glad your "Clyde" era was a happy one. Ah Erin... I'm so sorry, for you and for your parents. It is so, so hard to let go of the furry members of the family, even when you know it's the best thing for them. I'm glad you guys got to have Clyde in your lives and that you got to love him as long as you did. He was truly a lucky dog. LOL. The picture was too much. I stumbled upon this thinking of my buddy Clyde. We had a beagle of the same name, constantly begged my parents for food, who gave in, and he becasme a little bit portly. We had to put him to sleep as well due to an undiagnosed degenerative illness (they thought it was like a doggy lupus). He was wonderul, I miss him a lot, but he was very similar to how you explain your buddy. Always in the middle of everything, but right there when you needed him.